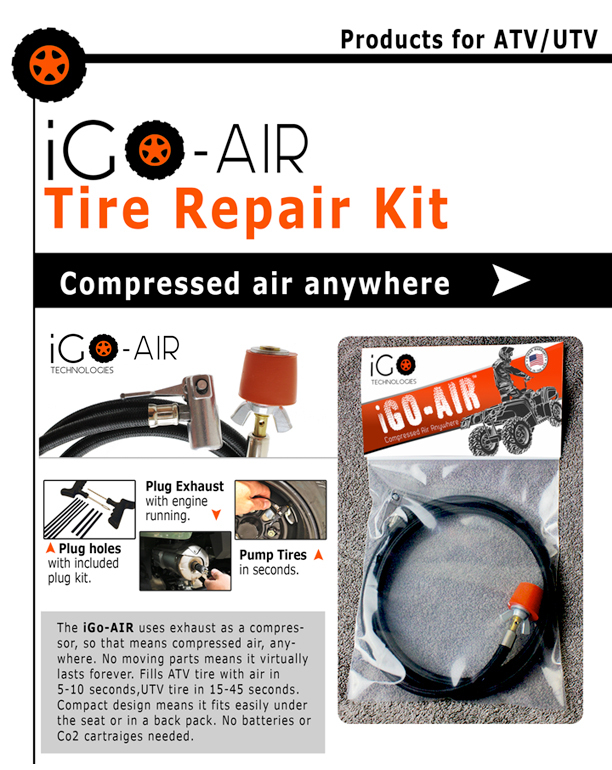 iGo-Air: An Innovative Portable Tyre Inflating Device or the ‘Jumper cables’ for your flat tyres...! Have you ever imagined a situation; in which, your car’s tyre ran flat in the middle of nowhere and you have no spare tyre in the car and the nearest fuel station / tyre service is miles away? This could be a nightmarish situation for any car driver; especially at the night. But, don’t worry... there is an innovative solution coming up called igo-air...!! iGo-Technologies; which stands for ‘Innovative Go Outdoor Technologies’, has successfully developed a portable tyre inflating device for the automotive industry. The iGo-AIR; which was originally designed for the off-road ATV/UTV market, is now being introduced for a range of automotive products. The decision to further develop the automotive version of the product - the iGo-AIR was apparently influenced by a number of requests from its current users. This led to current design; which is based on their original patented product that makes use of the waste exhaust gases of an internal combustion engine as a source for compressed air. 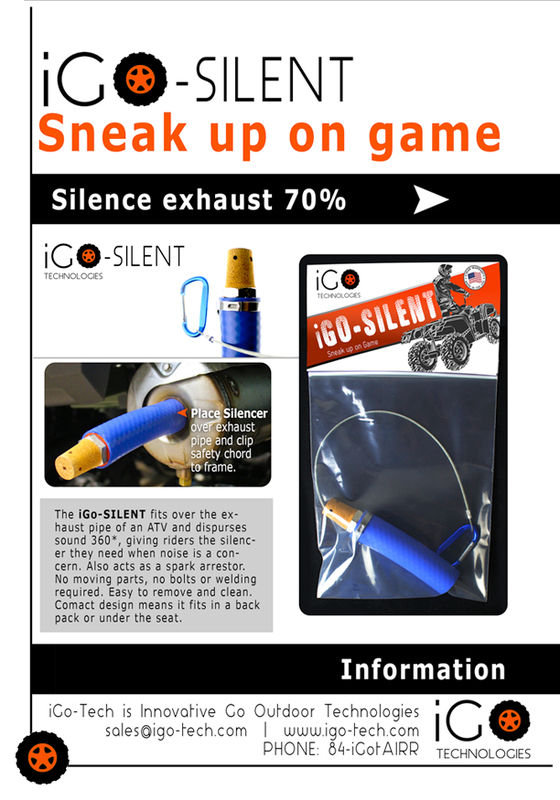 This new automotive version of iGo-AIR uses a part of the exhaust gases to inflate the exhaust plug. It fits perfectly on to the inner diameter of almost any exhaust tail-pipe. After fitment, just start the car’s engine, run it in idle and the exhaust gases start filling up the flat tyre. In matter of seconds, the flat tyre comes alive; ready to roll again and could drive you to the nearest tyre service. It acts just like ‘jumper cables’ for the flat tyre in case of an emergency & inflates flat tyre within seconds. Thus, iGo-tech has brought an innovative & very useful technology to the automotive industry. The company has also developed a tyre repair kit and an exhaust noise reducing kit –‘iGo-Silent’ for ATVs. Currently, iGo-AIR for ATVs is only available in United States in bulk quantities to cater to the market of the ATVs and UTVs. The parent company, igo-tech.com, is planning to launch it for rest of the automobiles; once it has adequate quantities of kits as per the market demand. The automotive version of the product is expected to be released by early 2016. It is also possible that iGo-Technologies is simultaneously working on an international version of the product which will cater to the vast automotive market worldwide. With iGo product in your car; we guess, you need not worry about flat tyres anymore...!! What is Ethanol Blending and how it is utilized? What is Cornering Brake Control In Cars & How It Works?